Today I'd like to feature a blog I follow. 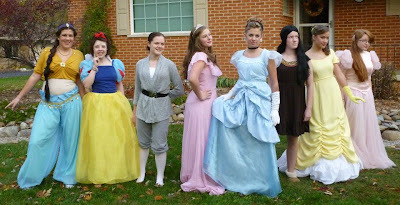 Check out the amazing Jane Austen costumes! What's New At Our Boutique? Vintage slippers make cute costume accessories! Post Card Sent North from Jacksonville Florida. I am enjoying the rich climate of Florida. Holidays are indeed a nice diversion. Today, we encountered the former Mrs. President, Mary Lincoln. Poor, dear soul, she has not yet recovered from the death of our dear President Lincoln. She wears black to this day, and keeps her drapes pulled at all times. The spring air is moist and humid here, but the seaside is refreshing. We have taken rooms at large, comfortable place in land in Jacksonville. I do believe we will stay a good while. Trust you are all fairing well, looking forward to seeing you upon our return. Now, I was not the designer, nor creator of this lovely dress. Credit goes to Willow (model & designer.) I just had to post it, as I love the large Ostrich feather hat and the velvet necklace. As you can see from this painting from 1875, this style of necklace was all the rage. Since our Honored Majesty's demise earlier this year, our chapter of Ladies Aid donned black for six months for every meeting of our chapter. I am glad to see the end of our darkness, for although we were free throughout the other days, I cannot think positively in black. Are not our chapters about the positive? Shall we not help others and bring a positive light into their lives? I have no creativity in black. I do like the dark midnight color for solemnity or elegance. In celebration (or protest, I neither know which), I shall wear white: Soft, flowy delicious white! And pink, my rich rose colored hat is luscious. I ordered it from Sears Roebuck end of a year past, and finished it with a matching bow arrangement last year. 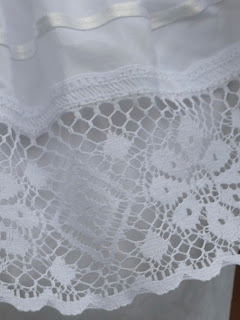 While my white chiffon is several years ago fashion, it is more than suitable wear for a Ladies Aid meeting. I had Miss Crembly make the dress about five years ago. 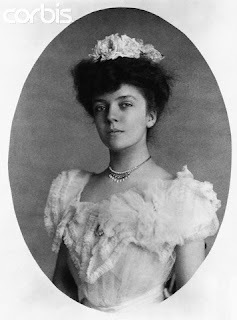 I fancied the dress after having seen the portrait of Lady Agnew (1892) by Artist Sargent. Her dress was blue, but I thought white was desirable and I had Miss Crembly made a few alterations. Well, the buggy has arrived, I shall write a full report upon my return. My own dress was very simple this year, I simply re-used the wedding dress that we used under the "Gone with the Wind Dress" last year. This was the best find, for $6 dollars, and to think I nearly didn't buy it! 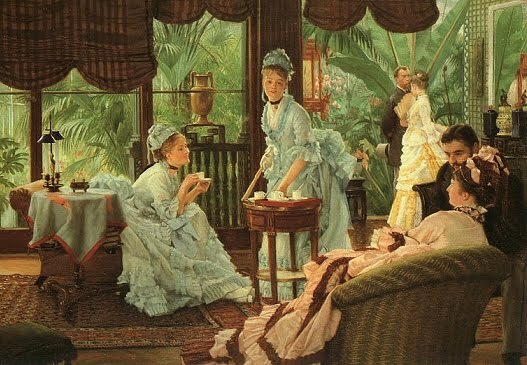 The loose and flowy dress came in around 1892 (as seen in the above painting), and continued throught to 1905. It was not as popular, as trends changed frequently, however the design was present. Here is a picture from 1905. And of course my dress for the Victorian Festival. Today is the inauguration of the Crystal Palace here in New York. I can barely breath for excitement. We are to arrive slightly before 10 o'clock this morning. With reference to we, I mean of course the charming gentleman I am honored to accompany. Admission tickets to the opening of the Crystal Palace are offered to gentlemen, allowing a lady to accompany. The Crystal Palace is structured after England's own, as such I am told. Tis to be a place of Exposition, Culture, and Invention. I am mostly excited for the music. Such an arrangement of musical exercises! Handel's Hallelujah corus, I am surely anticipating. The New York Sacred Harmonic Society are accompanied by the orchestra. I am fond of orchestra music, it is very refined. I am specifically fond of Symphony Orchestras. I shall wear my pale green shot-silk taffeta. Blue is all the range this year, as Mother suggested, I might wear the pale green instead of my blue dress, the effect would be to stand out more in the crowd. We also are possessors of the green tickets, so I shall be pleased to match. The bodice of my dress is smooth and flat, with detailed embroidery and sequins. Violet embroidery accents the hemline and waist. I am very satisfied. 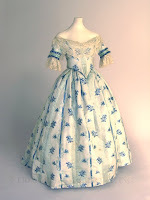 Dresses in 1853 an 1854 were considerably calmer than their earlier and later counterparts. The bodice being characteristically flat and not heavily adorned. 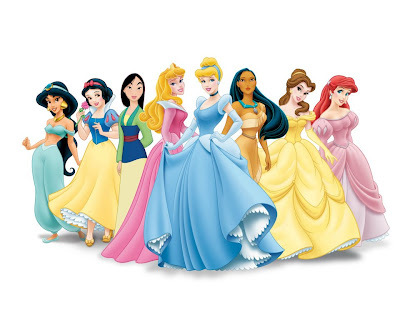 Usually, an evening gown was worn off the shoulder. A full skirt flared out from the waist, and was often of smooth design. You'll notice the simplicity, but the similarity to Kelsey's dress of an earlier era. I chose to use a two layer design on the skirt as seen in this simple drawing of a period skirt. We borrowed the crinoline from a friend. I picked up the fan at a Flea Market in Florida. Here sit I and how enthralled! I have received a missive from my dear mother's sister in England. She writes in hope of our well being, and of the latest notion, that being of taking tea in the afternoon. "Duchess Anna Maria Stanhope has introduced to ladies of nobility this delightful occasion. 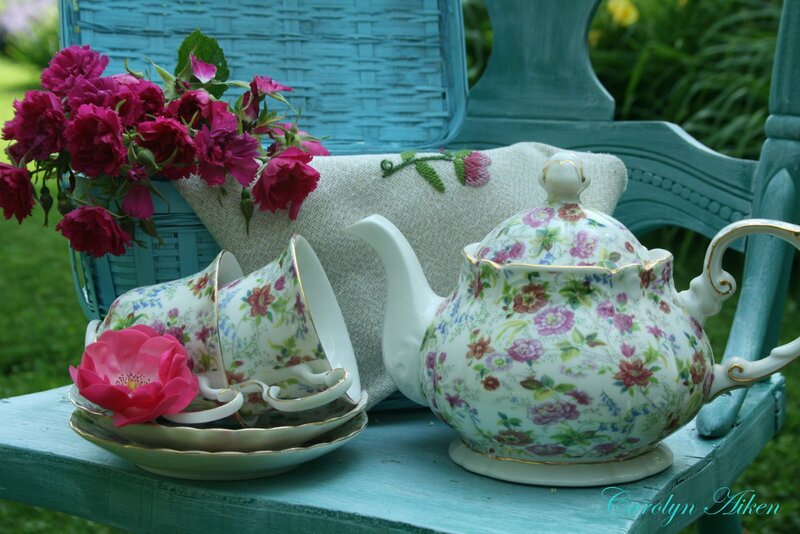 Afternoon Tea mainly consists of small dainties, savories, scones with preserves - and of course, tea. I am told this diversion is of immense popularity in the cottage country, as the Duchess frequently entertained in this manner. 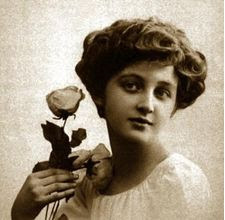 Ah, my dear, I was trilled to discover I too was the favored recipient of an invitation...."
I have found my aunt's letter to be an inspiration, for Duchess Stanhope is a lady in waiting to Her Majesty Queen Victoria. I believe our Loyalist heritage runs deep in my veins. To attend Afternoon Tea with a lady in waiting to her Majesty! I am inspired to extend invitation to my own dear friends, we shall have biscuits (my aunt calls these scones), and other morsels. Perhaps, father will bring some Turkish Delight, a new sweet from far away . I believe this dress was the hardest dress I have ever made. The dress turned out well, I received excellent assistance and advice on the finishing touches of the dress from Colleen, Willow, and Danielle. We made several alterations from my original design as the arms turned out too long, and we placed on the finishing touches as well. The collar too was a work in progress, yet the dress turned out lovely. 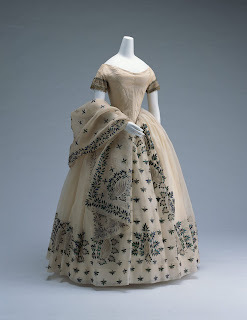 I patterned the dress after these designs (the far right is 1839). Bonnet credits go entirely to Colleen, as her was the artist behind decorating the bonnet. 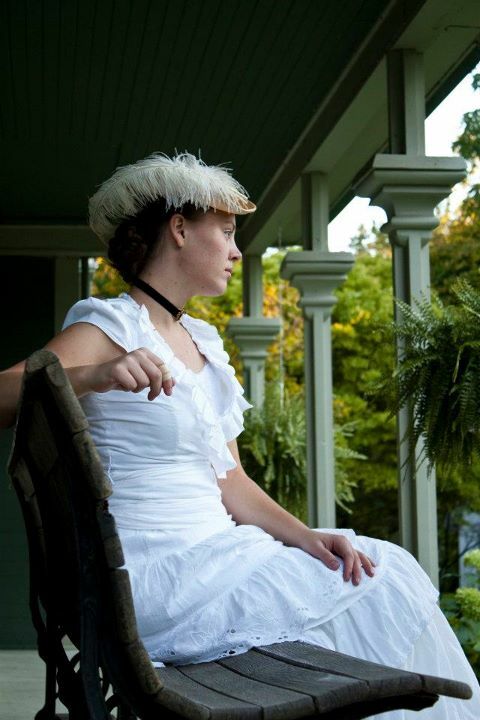 I believe the dress came out looking like it was from the Victorian era. The material is two flat bed sheets, a double for the back of the dress and a twin for the front. And here is the dress! Today, was a splendid day. Morning began with the whole house was buzzing with looming excitement as aromas of all sorts of delightful pastries and meats floated throughout crevasses and cracks, in the mansion in which I live. Today was the day of the Amhurst picnic social. Weeks of planing finally came to an end with this joyous event! I wished to savor every moment. 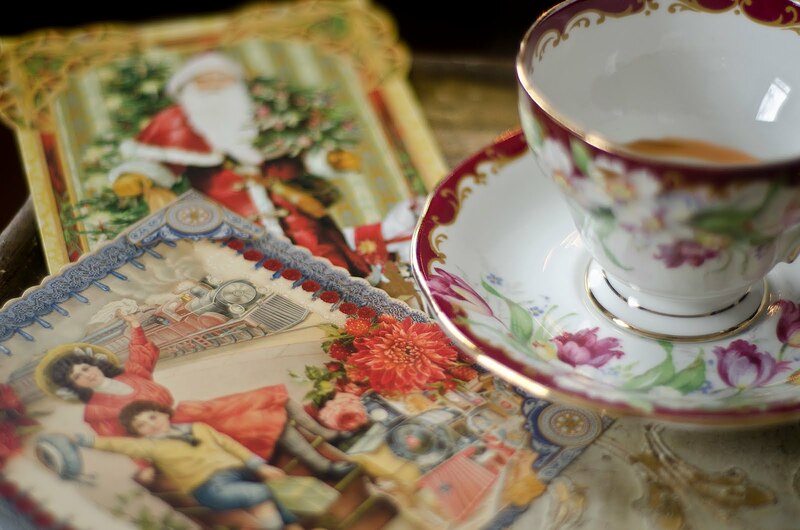 Curricles, barouches, Landaus, and even some town coaches lined up in rows as ladies and gentlemen gathered together with their baskets of china and food, to await the signal of their hostess. I, being the hostess had paid attention to every last detail, and insured that all was according to plan. 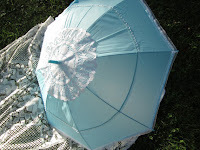 My entrance was grand, dressed in the perfect picnic colours of white and navy with a lovely lace parasol, gloves and a a grey and navy shawl, in case of cooler weather. For although I had thought of everything and made certain that all would be just right, there was two things of which I had no control. few years. I wondered,Would he come to the picnic? He had been invited, and if he did come would he be much changed from the boy I used to play with when I was a little girl. These where the two things i could not control and the two things that started the whole story….. 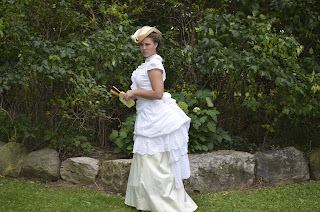 The Picnic Social dress is made of a full starched blouse and a changeable silk A-line skirt. 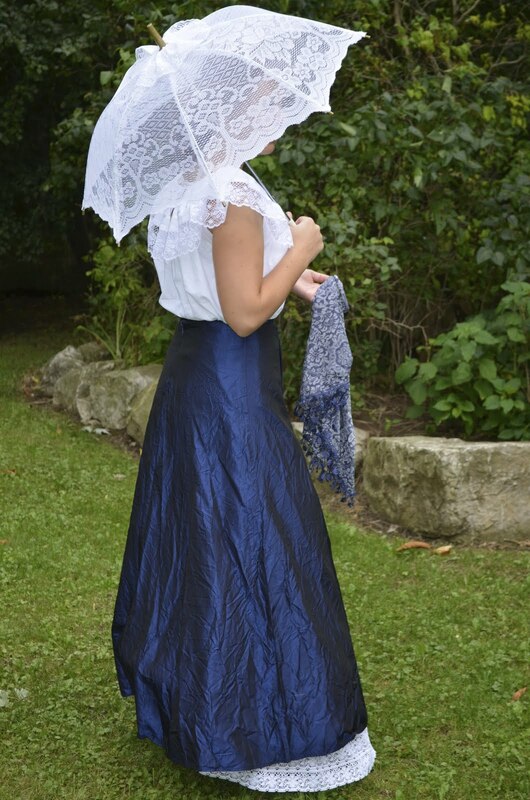 The A-line skirt became popular in the 1890s. Below are pictures ranging from 1890-1892. The dress required the medium sized hoops, also I made a petticoat edged in lace. The petticoat is made of heavy white cotton, made in two part joined. 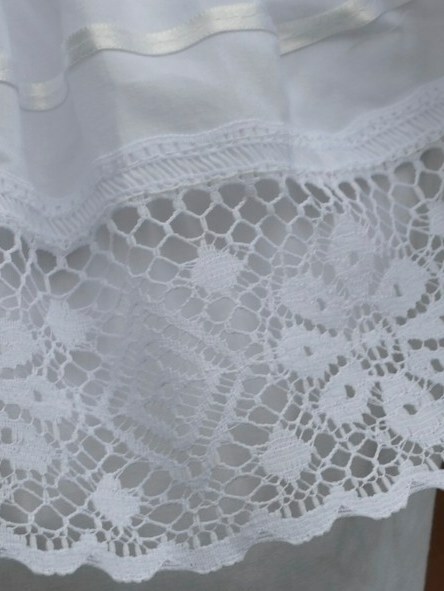 The lower part is actually a tablecloth edged in lace. As you can see from the pictures, the skirt can be worn straight or with drapery effect poofs. The poofs are created by tying ribbons together on the underside of the skirt. Tonight, we aspire to host a dinner party for several couples in our popular circles. I have attired the dinning hall this afternoon with late August blossoms and lighted the candles. Our new electric bulbs are too harsh for this event, the soft glow of the candelabra must certainly suit. I instructed cook as to our menu at the end of last week, we are to have broiled chicken, mashed potatoes, succotash, cauliflower, green long beans, garden toss salad, plum sauce, and white rolls. For dessert we are have sponge cake, ice cream, peaches, and coffee. Normally, I would enjoy assisting in dinner preparations, I simply love the Enterprising Housekeeper. Yet tonight, I must prepare to entertain. I plan to wear my new brown & cranberry silk gown with the square cut Spanish rubies. Financier Henry and Mary Pellet are honored guests tonight, I imagine he will be speaking of his elaborate Chateau he plans to build soon. I dare say he is fond of Spanish elegance as he speaks of calling his masion Casa Loma. Well, I must hasten downstairs, for I hear the door. . . This is an original, I am not sure as to the date, but it was early 1900s. The Dinner Party dress design was based on these three looks, right (no date) and left below (1901). Also, note the similar design used in the Titanic (I read that this dress was designed after the picture at right). Also, a trending evening gown style for 1901-1903.